This is a new weekly feature on Southern Fried Science where we’ll highlight 4 or 5 posts from other blogs in our network, and one post from outside our network published in the previous week. Posts of Note will run every Thursday, but the hosts will alternate among myself, Andrew, and Amy. Enjoy this week’s selections! Chuck’s daily summaries (Day 1, Day 2,Day 3, Day 4, and the Aftermath) from the recent American Elasmobranch Society conference are a great way to learn what the leading shark scientists of North America are up to these days. If you have any questions about any of the presentations he describes, leave them as a comment and he’ll explain them further. Iris the salmon girl discusses preparations for her recent research cruise. Read it to learn a little bit about salmon and the techniques used to capture them. The post even includes a gratuitous salmon photo! This post will be part of a series focusing on salmon research field techniques, so be sure to check back at from Alevin to Adult regularly to follow Iris’ adventures. 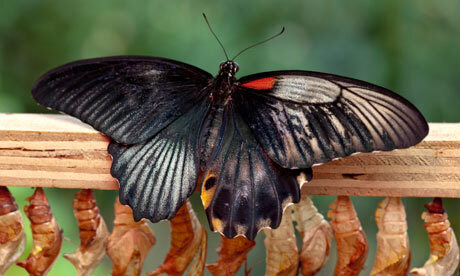 Chris at the Skeptical Moth reports that a cool butterfly has been spotted at the British Museum’s butterfly house. He also uses inaccuracies from the media coverage of this event to teach us about butterfly biology and evolution. Rebecca of the Birds, the Bees, and Feeding the world explains, in video form, that science is important because cake is delicious. This video is her contribution to a wider discussion on the importance of science. As it turns out, science and technology are crucial at every step of making a cake, including farming, transportation, and baking. This video is a really clever way to explain science to the general public, though it may make you hungry. Finally, Deep Sea News’ Al Dove introduces Shark Cam, a live stream of the Georgia Aquarium’s Ocean Voyager tank that’s online in honor of the upcoming shark week. Al also has a running challenge on the blog post asking readers to identify as many species as they can. Warning: this has ground all productivity at my lab to a standstill and may do the same for you.